A Global Times poll has found that respondents from seven major cities regard the social welfare and social security systems as the most anticipated areas for reform at the upcoming plenum of the Communist Party of China (CPC) Central Committee. The survey by the Global Times Global Poll Center, conducted through phone calls and via the Internet from Monday to Thursday, collected responses from 1,252 residents above the age of 18 in Beijing, Shanghai, Guangzhou, Chengdu, Xi'an, Changsha and Shenyang. The result of the poll came before the opening of the Third Plenary Session of the 18th CPC Central Committee on Saturday. The four-day plenum is expected to roll out a package of reform plans, with top leaders repeatedly vowing to comprehensively deepen reforms. According to the poll, more than 63 percent of the respondents said they will pay close attention to the plenary session, while some 36 percent said they will pay no attention. In the multiple-choice survey on what respondents hoped from the plenum, reforms on the social welfare and social security systems, income distribution system and anti-corruption mechanism led the votes. Nearly 80 percent of those surveyed said they look forward to reforms in the social welfare and social security systems, while over half of the respondents also welcomed reforms on the income distribution and anti-corruption fronts. 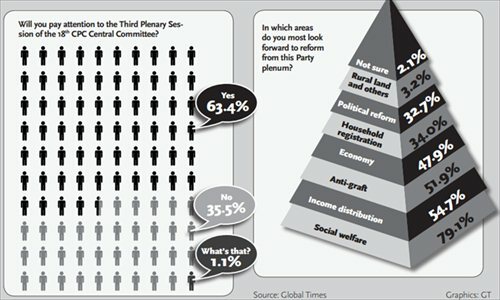 In comparison, only about 33 percent of the respondents chose the political system as their desired area of reform. It also suggested that respondents who were male, older or holding at least a bachelor's degree are more prone to calling for political reforms. The result shows that while political reforms are aspired for by people mainly from the elite class, the majority of the public pay more attention to issues that are related to their livelihood, said Xu Yong, dean of the Research School of Politics at Central China Normal University. "The most significant social conflict is the inequality in social welfare among people from different social classes," Xu said, citing the example of the gap in pensions between retirees of government departments and private enterprises. Mei Xinyu, a research fellow with the Chinese Academy of International Trade and Economic Cooperation affiliated to the Ministry of Commerce, said that the objective of reform is to have the majority of citizens share its benefits. "Social welfare and social security are one of the means to share the fruit of reform and development, and achieve common prosperity. The result of the poll shows the authorities' stress on achieving common prosperity has deep public support," he said. Regarding the reform on income distribution, the expert said there was huge progress in poverty alleviation in the past decade, and the policy stress in the coming decade would shift to expanding the middle-income group. The poll also found that 40 percent of the respondents hope the plenum would unveil "powerful" reform measures "on a wide range" of areas. Some 27 percent said they want reforms in a "steady and aggressive" manner, while 26 percent wanted continuity and some fine-tuning of policies. For the obstructions to reform, over 45 percent of respondents regarded some local authorities' disobedience of central government's decrees as a major source, while about 30 percent of them blamed vested interest groups. "It shows the central government maintains a fairly good image and high credibility among the public, while most people blame local authorities for their discontent in life, which adds to the pressure on local governments," Mei said. Meanwhile, over 50 percent of the people surveyed said they are willing to sacrifice their own interests for reform, while nearly 40 percent replied that they would not. Looking into the next five years, over 80 percent of the respondents are optimistic that their standard of living would be improved as a result of deepening reform, while some 11 percent lack that confidence. "The public's unprecedented attention to the plenum reflects their high expectations for addressing social problems, especially in achieving social justice. In some ways, the expectations exert pressure on the government, who ought to respond to the public's concerns," Xu said. "The authorities shouldn't stop short at raising the principles of reform. In addition to stressing equality and justice, it should unveil a timetable for the reform and implement it step by step," he said.